RedIce Racing consists of two talented brothers, Yiani and Ilya Harpas. Both race 250cc International Superkarts (Formula E) and run Zip-BRC packages. 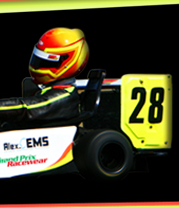 Ilya will be the only driver representing RedIce Racing in the 2013 Australian Superkart Championship, with Yiani calling time on his Superkarting career for the time being. Here you will find the latest news and images, driver profiles, and other information about RedIce Racing and the various organisations/companies that lend their support to the team. Copyright (c) 2007 Red Ice Racing. All rights reserved.